In this bi-monthly feature, I profile the recent results of the top 10 rated men and top 5 rated women in the USA. Access the complete October 2006 Top 100 lists here, avaliable for the first time on our redesigned site. In between August and October there was very little movement amongst the top players. The faster climber so far in 2006 is U.S. Open champion Yury Shulman, who has shot up from #17 to his highest placement ever on this list, #6. Yury has established himself as a clear contender for the 2008 Olympiad. The teams are changing from six player squads to five, and I suspect the fight for boards four and five will be particularly fierce. Gata remains in first place for the third consecutive list. His competitors aren’t really in striking range just yet, as he has a solid 44 points lead over Hikaru Nakamura. Gata hasn’t played in the USA since his strong showing at the World Open in July. Hikaru has started college at Dickenson University, so this is probably one major reason why he also hasn’t played since the World Open. Chess fans hope to see both Hikaru and Gata back in action shortly. Alex hasn’t played in the USA since the last supplement but he did play in a strong Round Robin in Montreal (4/9) and is also part of the team of seconds helping Veselin Topalov in his match versus Kramnik. Kaidanov competed in the U.S. Openin August and had a solid second place finish behind Yuri Shulman. The game that took him out of the hunt for the US Open title was a seventh round loss to 14th ranked GM Joel Benjamin and can be found in this article. Ildar’s biggest success of the last two months was his tie for first at the NY State Championship. Ildar gave up a draw to GM Benjamin but defeated Igor Nikolaev (2438), James Critelli (2311) and IM Jay Bonin (2338) en route. Yury Shulman is blazing up the charts like a rocket, having gained over 50 points in the past 6 months. He seems to be more focused on chess than ever before and I don’t think anyone would be surprised to see him make a run at 2700+.Yury’s 14 points came at the U.S. Open, in which he won clear first place. This victory included a penultimate round victory over GM Alexander Shabalov. Jaan has spent most of the summer in Europe, so his USCF rating barely changed. Jan’s only U.S. based tournaments in the past few months were some Marshall Chess Club events, in which he performed at about his rating level. 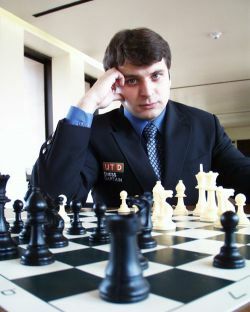 He recently returned to the U.S. and is playing first board in the U.S. Chess League for the Philadelphia Masterminds. Larry hasn’t played a rated USCF game since the US Championship in March. He has played a few games in the US Chess League, helping to make the Boston Blitz the Eastern division frontrunner. Boris hasn’t played since the Mayor's Cup in June. Varuzhan has actually lost rating points in this supplement yet managed to vault into the top 10, mainly due to the demise of Alexander Ivanov. Akobian’s one event in the past two months was the Southern California Championship. Akobian was likely the favorite to win, but gave up three draws in six rounds (to GM Melikset Khachiyan, NM Joel Banawa and eventual winner IM Valentin Yotov) and was only able to finish in second place. The top 15 players in the US are exactly the same as they were in October, with only a few differences in order. Alexander Ivanov took a huge fall, dropping 22 points and moving from 9th all the way down to 15th. Joel Benjamin continues to rise, gaining another 14 points this list and is getting closer to a spot in the top 10. For the second supplement in a row, the women have been very inactive. Let's hope this changes soon. Susan hasn't played in the USA since winning the Mayor's Cup. She has a history of playing very few events, but when she does play she is without question the top female player in the nation. According to the USCF website Anna has played in zero tournaments in the past few months. However she mysteriously gained one rating point during that time. She is expecting to be 2500 in 3 more rating lists. Irina has played almost no USCF events but has been active internationally, both in Montreal, Canada and Israel. She has also been competing in the US Chess League for the New York Knights and is currently in contention for the MVP award. Her only USCF rated event was the St. Johns Masters at the Marshall Chess Club in which she gained one rating point. Rusa has just played in the Eastern Chess Congress and lost 2 points, however that event was played too late to be rated for this supplement. Camilla didn’t play this rating period. These two are clearly the most serious threat to break into the top five, as they are both relatively active and young players. Tatev just completed the World Junior Championship, held October 2-17, in Tatev's hometown Yerevan, Armenia. Tatev finished in 14th place. She was on the top boards for most of the event and earned a 2389 FIDE performance rating, but lost a tough last round game against Chinese star Hou Yifan (who won the silver medal on tiebreaks between 4 players with 9 points.) Tatev will begin the World Youth Championships (Batumi, Georgia October 18-29) shortly.